Avnix’s Heavy Duty Self Dumping Forklift Hoppers are constructed of 1/4″ and 3/16″ steel plate to endure the use and abuse of a fast moving construction jobs. Our self dumping hoppers are not the thin sheet metal hoppers you find in many industrial plants but tough long lasting forklift hoppers designed and manufactured for the construction industry. Ideal for removing broken-up concrete, plaster, brick, trash, debris and other construction refuse. Safety First … these features are standard on all Star Self-Dumping Hoppers. Hopper Safety Lock – a separate lock prevents the hopper from inadvertently dumping when traveling over rough terrain. Rope Release – permits releasing the latch from the ground or from the operator’s seat. 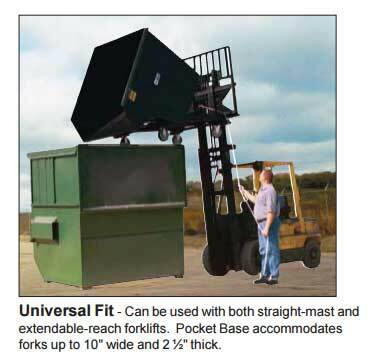 Forklift operator can discharge the hopper safely even when it is elevated. 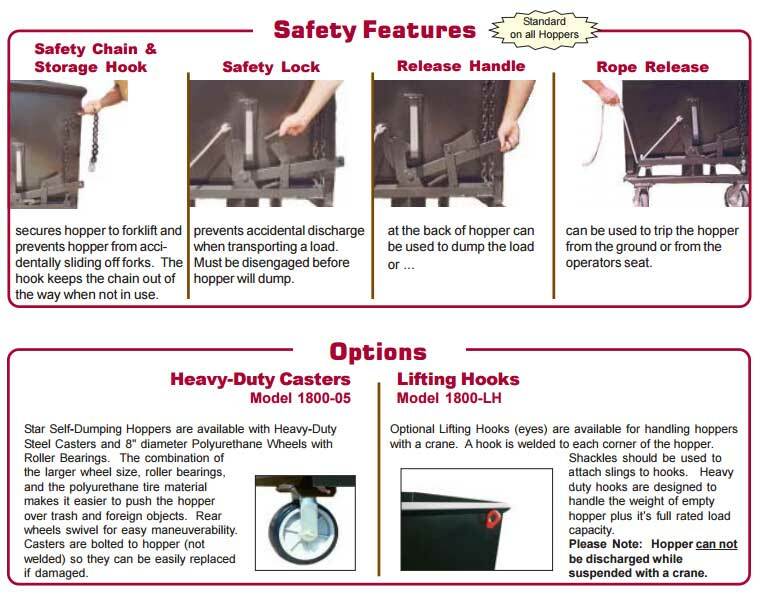 Safety Chain and Grab Hook – secures the hopper to the forklift. Ensures the hopper will not slide off the forks when traveling or dumping. 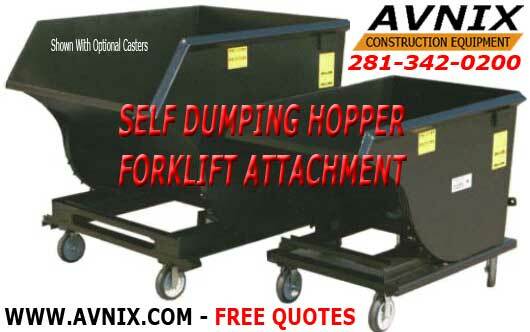 Avnix Self-Dumping Hoppers are available with Heavy-Duty Steel Casters and 8″ diameter Polyurethane Wheels with Roller Bearings. The mixture of the larger wheel size, roller bearings, and the polyurethane tire material makes it easier to push the hopper over trash and foreign objects and debris. Rear wheels swivel for easy handling. Casters are bolted to hopper (not welded) so they can be easily replaced if damaged. “Forklift Self Dumping Hoppers Are Pimed The Coated With Black Enamel.